The line between the “war on terror” and the “war on drugs” is blurring in our state as well as our nation. Only a few miles away from massive flooding, widespread devastation, and the impoverished Crow Indian Reservation residents who had nothing yet lost everything ; our federal government is waging war on yet another state-licensed medical marijuana caregiver. Native Americans called into radio shows yesterday to inform the outside world that several communities have no clean drinking water and many residents haven’t had food in two days yet our tax dollars are instead supporting unconstitutional seizures perpetrated by a dangerous gang of economic terrorists, commonly known as our own federal government. US House and Senate leaders have reportedly reached a bipartisan agreement to extend the Constitution-shredding Patriot Act after conducting shady back room meetings devoid of public input. Although the votes were largely symbolic, both Montana’s senators voted no on Patriot Act cloture which passed 74-8. America massacred our boogeyman and through that process proved that we are capable of capturing and killing our enemies without trampling on the rights and privacy of our own citizens. Perhaps when Americans realize that the Patriot Act has been used primarily to rob and imprison American drug dealers instead of terrorists, they will protest. Any doubt over which war the Patriot Act is actually fighting is erased after reading that in fiscal year 2008, 65% of all “sneak and peek” requests were drug cases and out of the total number (763) that year, only THREE of them involved terrorism. The “War on Terror” was nothing but the vehicle for invasive policy changes to escalate our nation’s failed “War on Drugs” and 9/11 was the excuse. No wonder the truth movement exists. For those of you who don’t use marijuana and thus don’t care about what is happening in your country and your state as long as it involves cannabis, you may want to consider briefly what Ben Franklin said about sacrificing liberty for the sake of security. Someday it won’t be marijuana, maybe it will be your religion or God forbid, your firearms, but someday, YOU may hear a knock at the door from a heavily-armed team of friendly law enforcement officers who shoot your children’s pets, all in the name of public safety. We currently have a President who promised his administration would stop raiding medical marijuana facilities in states where medical cannabis is legal yet is on track to substantially exceed the number of such raids under the previous administration. Don’t expect such customary procedures as being able to read a warrant presented to you either- after all, you are guilty until proven innocent and will be treated as a serial killer until you are convicted- if you are ever even charged with a crime. If you aren’t, no worries; the federal government will smash and grab as much as they possibly can, seizing every asset connected to you. That way, you will have no way of hiring an attorney in your defense if the feds change their mind about charging you. Montanans currently have a governor who “held his nose” to allow a bill (SB 423) he considered “unconstitutional on its face” to become law, thus expanding Montana’s black market drug market and eliminating safe cannabis access for our state’s ill. Knowing the flawed legislation would likely be caught up in legal battles does not justify the governor’s inaction. This battle will be long, difficult and expensive. Montana’s legislature, whose members bragged about deleting the emails of cannabis proponents before even opening them sought to overturn the will of Montana voters countless times in the 2011 session. Legislators scolded us for being in bad crowd, told us we were wrong in 2004 and declared that the use medical marijuana was similar to combining valium with arsenic . Our leaders seized any opportunity to compare Montana’s medical marijuana industry to the natural disaster du jour (Hurricane Katrina, Japan Tsunami) Our state is now faced with its own natural disaster. Speaker of the House Mike Milburn: “We’re not talking about the dikes holding back the water anymore, we’re talking about how do you rebuild the city.” This time, we aren’t talking about medical marijuana and we aren’t talking about Hurricane Katrina. We are talking about Montanans in need- something Milburn doesn’t seem to care about. This entry was posted in 2011 Legislature, Brian Schweitzer, GOP God Squad, GOP Hypocrisy, Montana Medical Marijuana, Montana Reefer Madness, TEA party hyprocrisy and tagged Barack Obama, Brian Schweiter, Mike Milburn, patriot act by nic. Bookmark the permalink. I’m just dumbfounded this is happening. Instead of sending food and helping, they are busting doors to steal. Since no one ever gets charged I call it theft on all levels. In the latest raid, the caregiver wasn’t even allowed to read the warrant. I’d say WOW, really? But that’s no surprise. Did you see 11 Billings PD jackets were stolen from an unlocked, unmarked police car? Sure makes any faith in our crumbling LEO system dwindle. Plus who is paying for the 11 jackets and a radio? The officer? I read that, but I must have read only the initial report because it didn’t say anything about the car being unlocked. It also said there were only 3 jackets. Nice. Montanafesto, this might be your best post yet!!! I had NO idea that the Patriot Act money was being used this way. I knew I was against it for other reasons, but this is too much. It makes me think that all we hear about Islamic terrorists being behind the drug trade is made up propaganda to justify invasive laws like the Patriot Act. 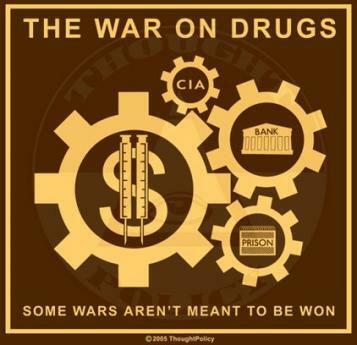 As if the money we spend–$500 PER SECOND– on the War on Drugs isn’t enough! This post needs to get national exposure. The repression by the feds must end. And yet our state is silent. I thought Schweitzer had balls but apparently he bows to pressure from the feds just like any other elected official. I’d love to see a Montana politician who actually stood up for Montana. want to see a politician who will stand up for Montanans? Send me to DC in place of Max and watch my smoke! If the Democrats are too frightened to do away w/filibuster abuse, I WILL PUT IT TO WORK. Unlike RAND and BERNIE I will use a hold or filibuster or whatever I have to do to stop the Patriot Act and other BS like it. I will actually mention raising taxes OUT LOUD, and work to do it. I will cut spending in defense and “intelligence” industrial complexes, I will move to replace regulation on Wall Street and force an audit of the Fed EVERY SINGLE FREAKING YEAR. These are just a few of my wacked out ideas! I find it very interesting that none of the Montana newspapers or TV stations have reported on this. Any ideas why? Are you referring to the raid or raids yesterday? Yes, I do have ideas why this isn’t being reported, but at this point they are all speculation. What happened yesterday was much different than earlier raids. Much more disturbing and worrisome. I keep looking, but this silence is worrisome. I agree. I called the gov office about it. That girl knows my voice by now. Probably the same reason someone has a speading ticket with cannabis on their person it’s headlines for a week. Yet when they catch people for prescription fraud for pain pills you, which is extremely common, you hardly hear a whisper. Another day with no news report. So the news media is ignoring a Federal raid? I think patients should call the AG’s office and MAKE them try to answer questions on some gray area’s of Essman’s giant turd of a bill. Maybe if more patients make them realize how bad this is, they will see the defeat on the horizon when it hits the courts. Essman’s letter in the Gazette today stunk of desperation and was full of lies. I’m referring to the raids yesterday. I think that many times Native Amercians are treated much differently, and I can’t help but wonder if the press is ignoring the story for a reason, or if they just don’t know. It makes my skin crawl to think of locals calling the Feds in on a citizen. The local sheriff called in the caregiver because he had a firearm of some sort. As if that is not legal. Apparently it justified a raid. Because it happened in Hardin, where the media were all likely covering the massive flooding in the surrounding area, it received no notice. Either that or nobody cares about Hardin. It wasn’t long ago that Hardin made national news for a private police force taking over their prison- by the time the media covered it honestly, reports were circulating that gates were built on each side of the city and police had confiscated everyone’s guns. It was unreal. I did a photo shoot at the prison totally mocking the situation. The pics are hilarious. Wow. Erosion of rights in front of our eyes. There’s a whacko that frequents the Missoula area blogs that thinks we should fill the Hardin prison with the MMJ cardholders. It’s a little too close to the truth for comfort. And yet, yesterday some of the big news was that CA had been ordered to free some 30,000-40,000 prisoners because the conditions in prison were no longer humane due to overcrowding. But that doesn’t stop Big Brother from throwing citizens in jail for what shouldn’t even be a crime to begin with. So, if you consider that the $500/minute spent on the War on Drugs is underestimated since you have shown us that even more money that is not accounted for is spent (under the guise of suppressive laws against “terror”), combined with the fact that we lock up more people that we have prisons for, the lunacy of these policies becomes overwhelming. Talk about self destructive policies! Why is it that we can see this, and yet the majority think we’re crazy for wanting to end these assaults on freedom and America. I should say, the majority of politicians, especially in Montana think we’re crazy for trying to end these abominations. This is a state where it’s citizens have guns. Not a big deal until you look at the ways the laws have been beefed up to really nab the bad guys. After reading that someone was charged with being an addict in possesion of a firearm I realized how little our rights mean in the wee hours of the morning. How can law enforcement determine addiction to marijuana without a medical exam? I can only watch the video up to hearing the dog yelp from being shot. After that blind rage, and frustration. There are non-lethal ways to safely detain people and pets. Our system of government is failing the checks and balances that were put in place for a reason. GW Pharma was granted a patent on Sativex. They have already petitioned the FDA for phase III testing. The DEA will offer some mumbo jumbo about pharmaceutical purity over home grown, and therefore as such still schedule I . There really are two classes of people in this country. The government and the governed. I have heard Essman, Paul Ryan and Eric Holder make the same assertion lately that is the nexus of the problem here-they all three believe we elect “Leaders” to “Govern” us. I always understood we elected representatives and not Rulers: there is an important difference. And being there watching several raids come down like this one has very nearly driven me to armed rebellion. We maybe need to learn something from our neighbors to the South of us-after noticing steel bars on all the windows and doors throughout Mexico, Honduras, Guatemala and Nicaragua I commented to a friend that they must have a LOT of crooks around. His reply-“those are to keep the police out!” I for one will build my next home so that any officer wishing admission will have to produce a warrant. It’s a shame we have fallen so far from freedom.